It’s a holiday for James Joyce fans, a holiday known as Bloomsday. 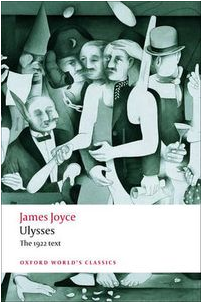 Joyce’s seminal 1922 novel Ulysses spans a single summer day in Dublin (1904), and now we know every 16th of June as Bloomsday, so named after the novel’s protagonist Leopold Bloom. Typical Bloomsday activities include Ulysses-themed pub crawls, dramatizations, and readings. Some committed fans even hold marathon readings of the entire book. and you’ll be automatically entered to win. In the meantime, I encourage you to read this short excerpt from Jeri Johnson’s introduction to the Oxford World’s Classics edition of Ulysses, in which she talks about the novel’s formidable reputation and the intimidation new readers sometimes feel. *This Oxford World’s Classics edition is currently available in the UK and will be published in the US this summer.